Refugees from DR Congo arrive at Kyangwali settlement Camp in Hoima last month. A cholera outbreak was registered a few days after their arrival. 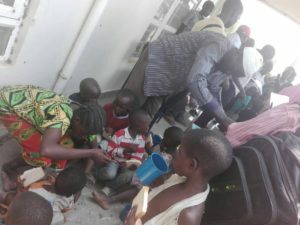 The death toll from the cholera outbreak among Congolese refugees in Hoima District has reached 34, with about 1,300 people under treatment, authorities have said. The first deaths had been reported in Kyangwali settlement camp and at a reception centre at Sebagoro Landing Site near Lake Albert on February 15. And now officials say the disease has spread to other sub counties such as Kabwoya as refugees, who are believed to have come with the infectious disease from back home, continue to leave the camps and spread out across the district. Dr Nicholas Kwikiriza, the chairperson of the district cholera task force, confirmed the deaths, adding that they are working with humanitarian agencies to contain the disease. The RDC, Mr John Stephen Ekoom, said they have stepped screening of new refugee entrants so as to detect and treat cholera cases.